IsaDora wants to meet women’s expectations. By focusing on lips needs, brand created moisturising oil. After all, every woman wants to have soft and perfectly moisturised lips, which would break men’s hearts. Thanks to Nourishing Lip Oil it is possible in just few minutes. Innovative formula of Nourishing Lip Oil is a novelty presented with Riviera 2016 collection. IsaDora promotes its product as a solution for all the problems with spring solstice. Moisturising oil for lips will provide intense regeneration for dry, flaky and irritated after winter lips. Rough atmospheric conditions do not have good influence on our skin, which is very dull, also on lips. That is why you should apply nourishing oil treatment with Nourishing Lip Oil. Moisturising oil from IsaDora is based mainly on two vegetable oils: Argan and Avocado. Vegetable oils used as a base for the product make Nourishing Lip Oil rich in moisturising, regenerating and antioxidant ingredients – complex of vitamins A, B, D and E, but also necessary for right functions fatty acid omega 3. Argan oil in this nourishing oil is responsible for moisture, but mostly has rejuvenating and nourishing properties. Extracted from Argan tree seeds oil is a source of youth vitamin and fatty acids, so it is great for strengthening the lips’ skin. Provides elasticity, soothes irritations, regenerates micro-damages and indicates anti-ageing properties. Avocado oil is rich in vitamins and omega acids, which make it a great antioxidant and moisturiser. Its main task in Nourishing Lip Oil is to increase collagen levels in skin. It is extracted from avocado and stimulates collagen fibres and thanks to it cares about vitality, youth and elasticity of lips. 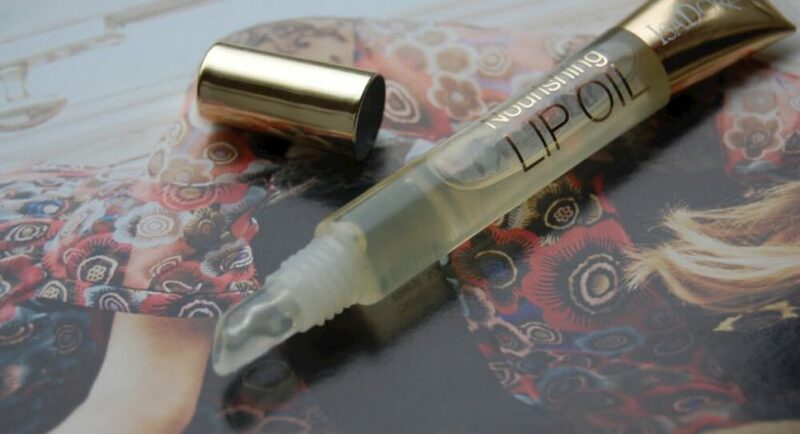 Nourishing Lip Oil is locked in long, stylish tube with cambered applicator. Product is colourless, leaves transparent, glossy finish. It has delicate gel-oil formula and distributes well on lips, but also right after application covers lips with protective layer of nourishing ingredients. Moisturising lip oil from IsaDora tastes like lime and vanilla.